KeepSolid recently released a Windows Store version of its VPN Unlimited app for Windows 10 machines after overhauling the traditional Windows desktop app, as well as the app for Mac. We haven’t reviewed a Windows Store VPN app yet, so this seemed like the perfect opportunity. 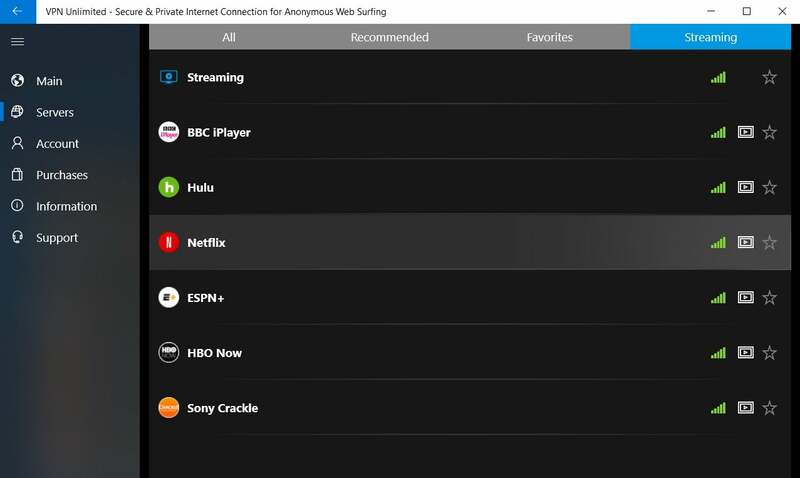 KeepSolid’s VPN Unlimited for Windows 10 with dark mode enabled. VPN Unlimited for Windows 10 isn’t all that different from the new app for Mac and Windows. When you first open it you’re greeted with a world map showing your location as well as the potential connection points for the VPN. The map isn’t interactive (once again), but purely informational, showing your home IP address and the IP address you’re connecting to. To select a server you can either hit the Servers menu option in the left rail, or click on the current-location tile at the bottom of the main screen. VPN Unlimited offers 51 country options, as well as several streaming-specific servers including BBC iPlayer, Netflix U.S., ESPN+, HBO Now, Sony Crackle, and Hulu, as well as a generic U.S. streaming server for the TV networks and YouTube. One thing I miss in this Windows 10 version (which was present in the last desktop version I looked at) is that it doesn’t display the workload of the current server. Instead, it displays a set of reception bars similar to what’s on your cell phone to give you an idea of how usable each server is from your location. VPN Unlimited allows torrents on specific servers that are marked as such in the list. The server section also has tabs for recommendations based on your location, your favorites, and all the streaming options. That’s about it for features. The rest of the app’s menu options are for renewing your subscription and managing your account. The settings section is also pretty light, with the option to use the light or dark mode, and an option to run the app on startup. There’s no internet kill switch, protocol selection, or anything like that. VPN Unlimited is priced at $60 a year for five devices, and at this writing the company was offering three months free with a yearly subscription. There’s also a three-year subscription for $100 and a lifetime subscription for $200. If five devices isn’t enough there are also pricing plans for 10 devices. VPN Unlimited’s streaming server options. VPN Unlimited’s speeds are about the same as the last time we looked. In our tests, we got about 35 percent of the base, on average. That’s a little bit slower than we saw last time around, when it retained 38 percent. The difference between the two is so small, however, that it’s pretty much a wash. Scores for the more recent app were brought down by one noticeably slower testing period, where around 23 percent of the base was maintained. The other two days we tested, VPN Unlimited hit 45 and 37 percent of the base, respectively. Overall, the speeds are good. Still, the company does collect some information from VPN users, the company said, including your device name/code, and your email address or social network identification to log in to your account. KeepSolid accepts payments via credit card, PayPal, Amazon, Bitcoin, Bitpay, and Paymentwall. The company CEO is Vasiliy Ivanov, and the company’s official business address is in New York City, though most of its team and leadership are based in the Ukraine. 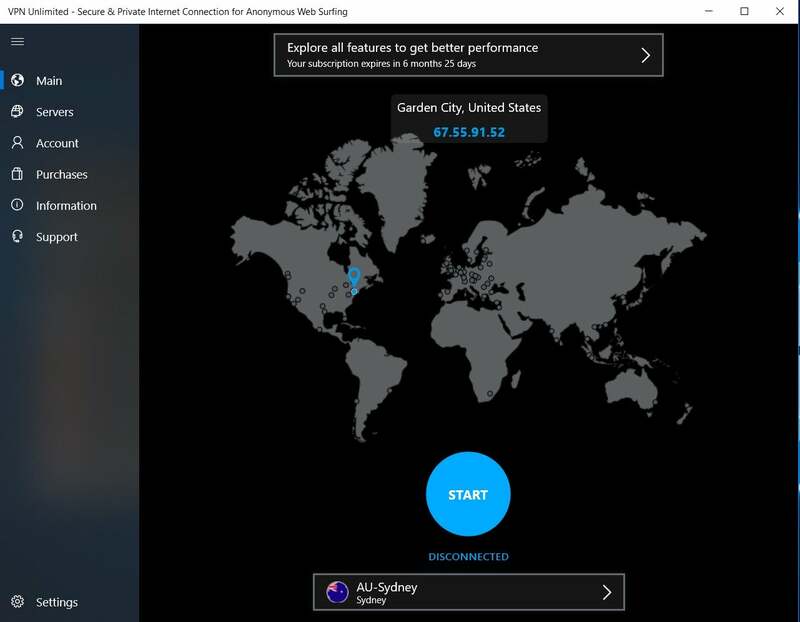 VPN Unlimited for Windows 10 offers good speeds, and the app is easy to use. I’d still like to see that map become interactive. But the fact that the VPN works with Netflix and many other streaming services at a lower price than NordVPN is a plus.